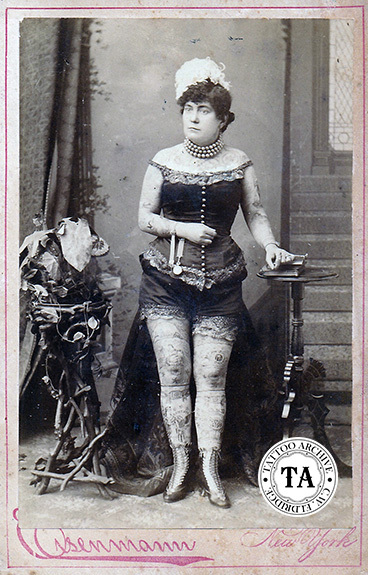 If you have done much research on tattoo attractions from the late 1800s and early 1900s, you have read some truly fantastic stories. It was the norm during this period for attractions to invent tall tales to explain how they found themselves on the sideshow stage. But Nora Hildebrandt’s story may take the cake. As the Indians were tying Nora’s father to the stake, they noticed his tattoos and Sitting Bull said he would assure their freedom if he tattooed his warriors. One of the warriors accused Nora’s father of trying to poison them so Sitting Bull changed his mind and promised their freedom if the father would tattoo Nora from head to toe. Nora, trying to save her father’s life, convinced him to do the tattooing. Nora was then tied to a tree and the tattooing started. Working six hours a day for a year he completed three hundred sixty-five designs on his daughter. Quite a tale! And we are sure this story worked for Nora Hildebrant in many ways. It would make great print copy so the press would be drawn to her. It would appeal to sympathetic audiences and perhaps encourage them to buy more pitch cards and pamphlets as a way to help the poor, tortured woman. And lastly is the idea that since the tattoos were put on by force, it excused any thoughts of Nora Hildebrandt being a loose or flighty woman that would have been so condemned during this period in American culture. For more on Nora Hildebrandt see The Tattooed Lady by Amelia Klem Osterud.